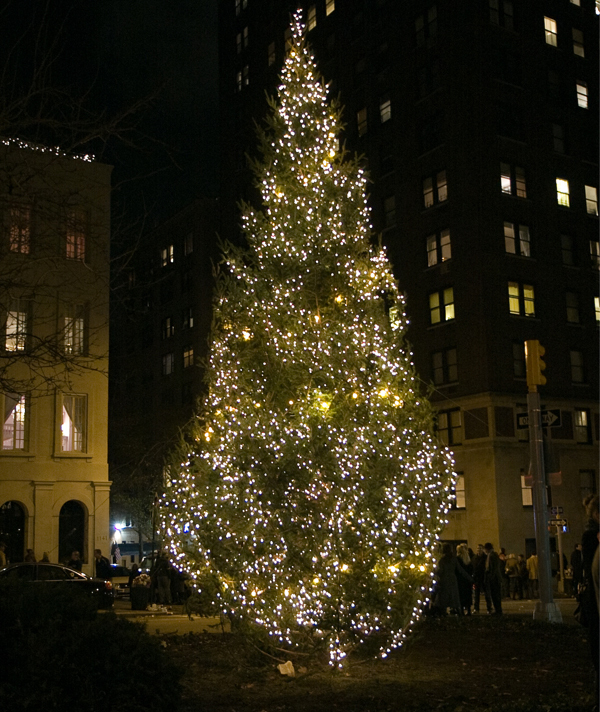 If you have ever appreciated the beautiful flowers in the spring lining the malls down Park Avenue or the sparkling lights at the holidays, you have The Fund for Park Avenue to thank. Since 1980, this privately-funded beautification program has been responsible for the planting and maintenance of the lovely tulips and flowering trees in the spring and colorful begonias all summer long that enhance one of the most well traveled avenues in the world. 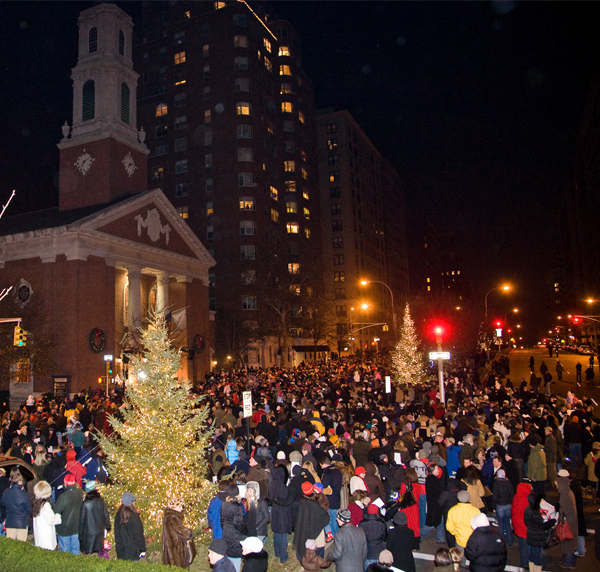 In addition, The Fund manages one of New York’s most beloved traditions – the annual Park Avenue Tree Lighting. Begun in 1945 as a memorial to those who lost their lives in World War II, it fell under the auspices of The Fund in 1981. Lit on the first Sunday of December the trees are a reminder to those who have served as well as a celebration of the season. It is a festive occasion that attracts thousands. In addition to the plantings and lightings, the malls have become a showplace for works of art, presented by The Sculpture Committee of The Fund and the Public Art Program of the City of New York’s Department of Parks & Recreation. 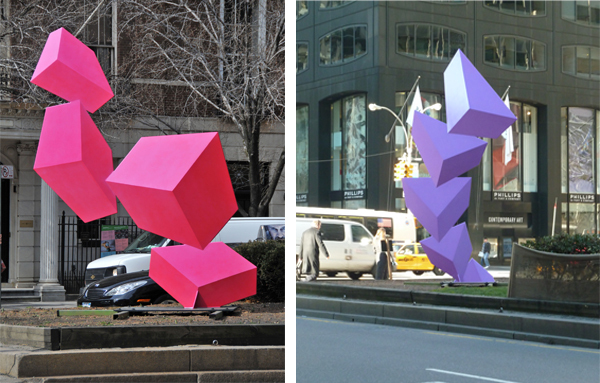 The spring, nine pieces by Venezuelan artist, Rafael Barrios line the malls from 50th to 68th streets. 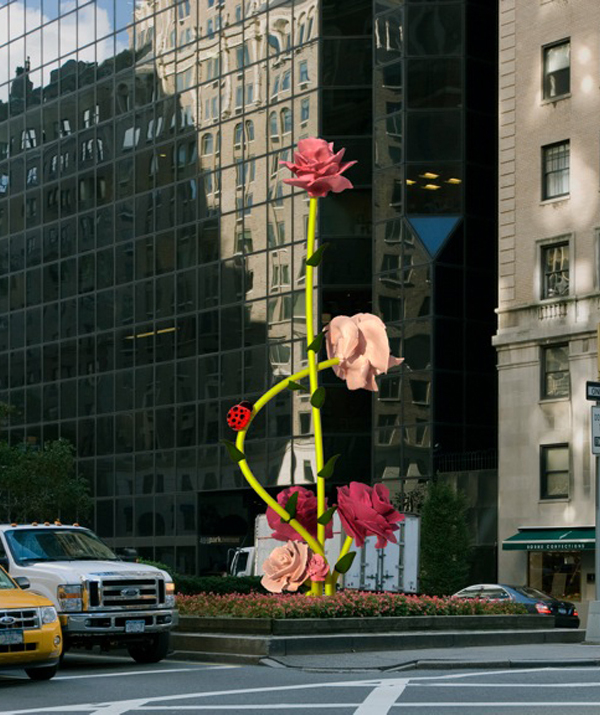 Many of you may remember last year’s installation of Will Ryman‘s “The Roses,” 38 enormous blossoms adorned with brass aphids, ladybugs, beetles, ants. All of this work is accomplished by the generosity of the community and the fund’s contributors. 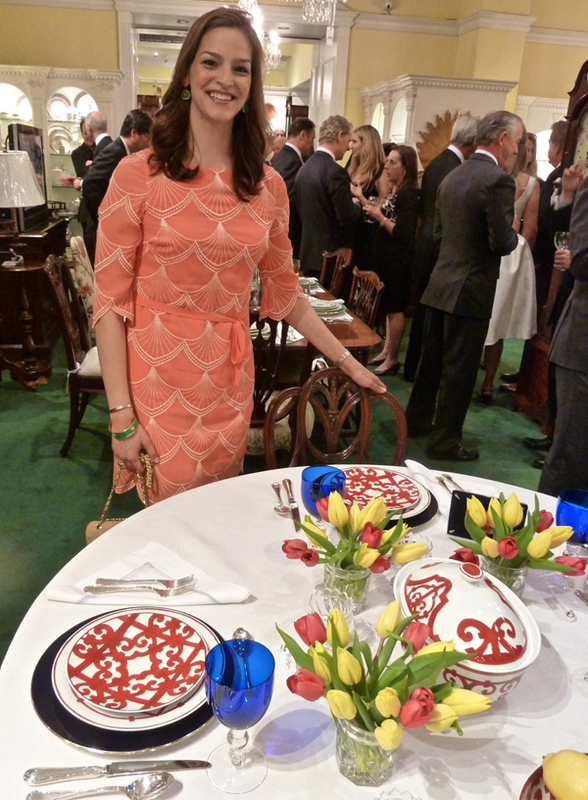 I attended a reception earlier this week, celebrating the spring tulips and the Fund’s work. 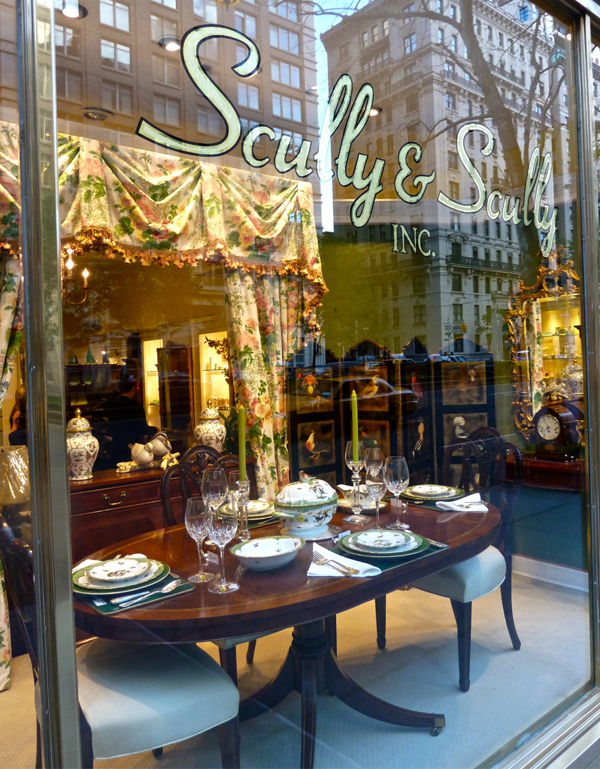 Appropriately held at the Park Avenue institution Scully & Scully, the store donated a percentage of its sales for three days to enhance The Fund’s coffers. 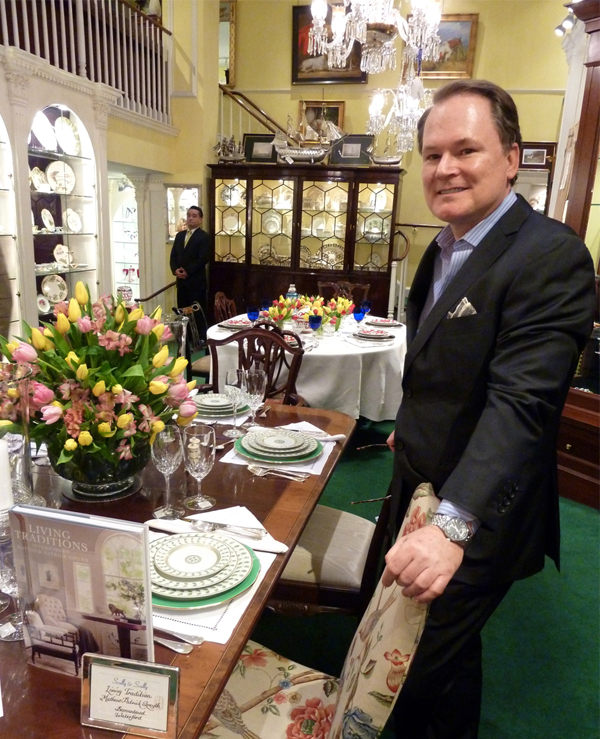 Since 1934, this venerable destination has been offering traditional home furnishings, gifts, bridal registry, interior design and tabletop consulting in its gracious and upscale environment. The fun venue for the evening included five tabletop designs inspired by books, blogs and their authors. Mathew Patrick Smyth’s Living Traditions was the basis for his fresh spring design. A nesting of Bernardaud’s Phoebe Constance sat on a Herend charger coordinated with Waterford’s classic Lismore Essence. I think I may need that beautiful William Yeoward hurricane. Friend Melissa Morris who pens her eponymous blog assembled a cheerful design with all the primary brights we are seeing on the runway. 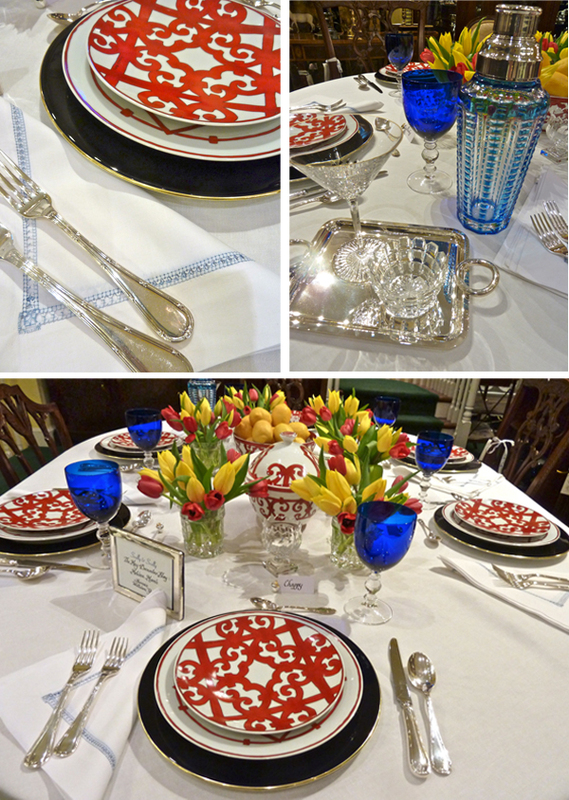 Melissa used one of my favorite patterns – the graphic Hermes Balcon Du Guadalquivir with William Yoeward cobalt goblets and the chic Lulu cocktail shaker. 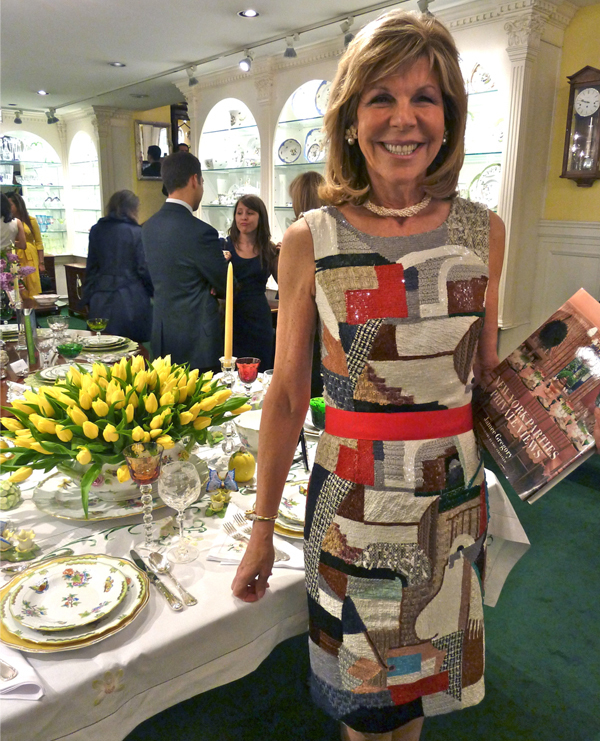 As the author of New York Parties: Private Views, Jamee Gregory had literally a volume of inspiration at her fingertips. 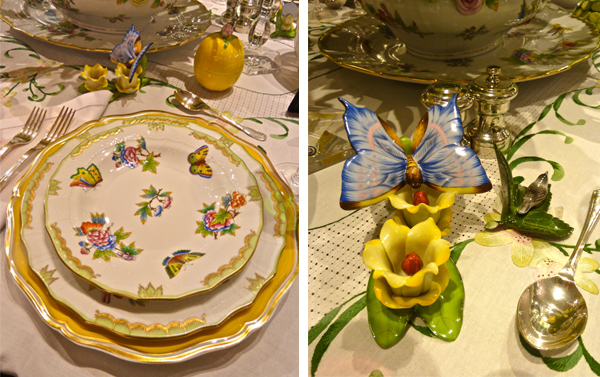 Handpainted Herend was a pretty ode to nature’s spring bounty. Hilary Geary Ross collaborated with famed photographer Harry Benson to produce New York New York, a compilation of portraits of distinguished New Yorkers. 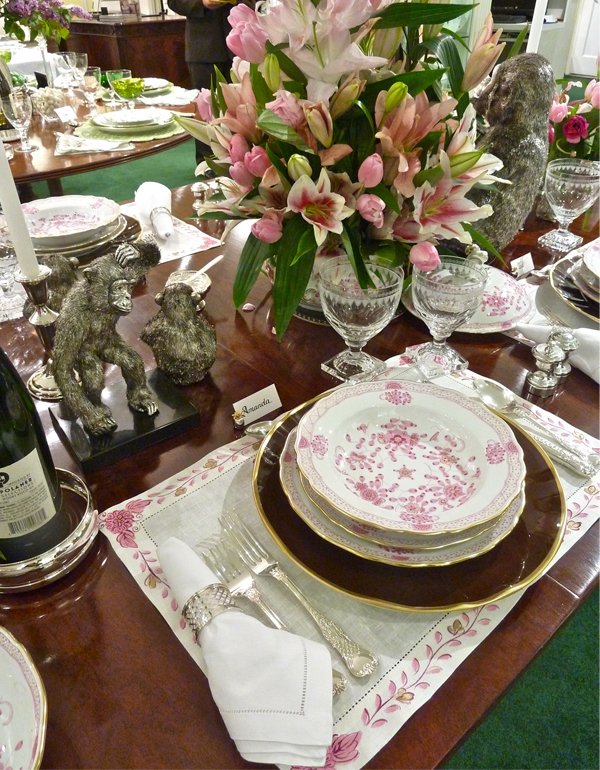 Her pretty in pink table with Meissen’s Oriental Flowers and William Yeoward crystal maintained a light attitude and sense of humor with the whimsical silver chimps. 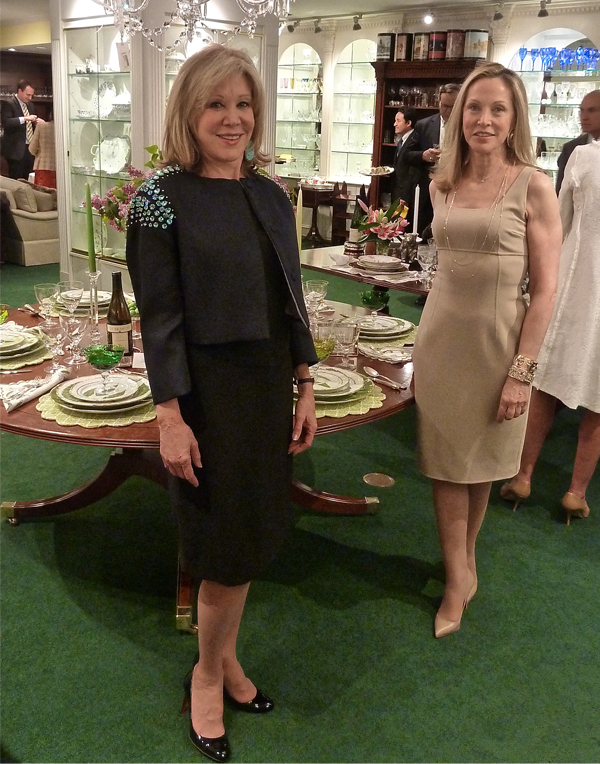 The authors of The Rooftop Gardens: The Terraces, Conservatories, and Balconies of New York, Denise LeFrak Calicchio and Roberta Amon, created a tabletop worthy of their editorial features. 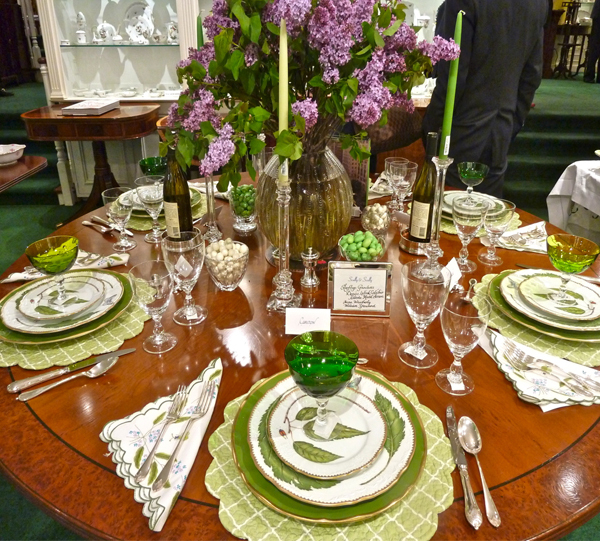 The stunning seasonal green and lavender palette would look beautiful in any venue! Anna Weatherly’s hand painted pieces are amazing works of artistry. 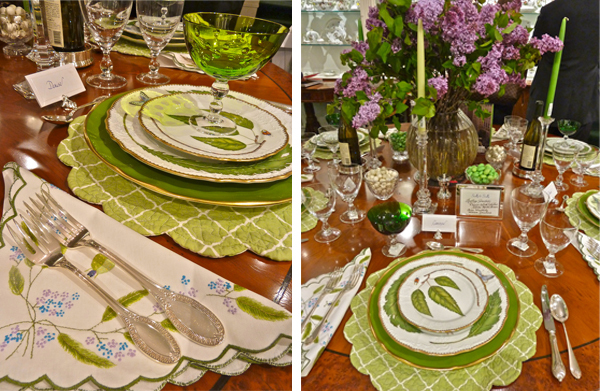 I love the green St. Louis Bubbles coup – a beautiful versatile classic interpreted for the season in a vibrant green. 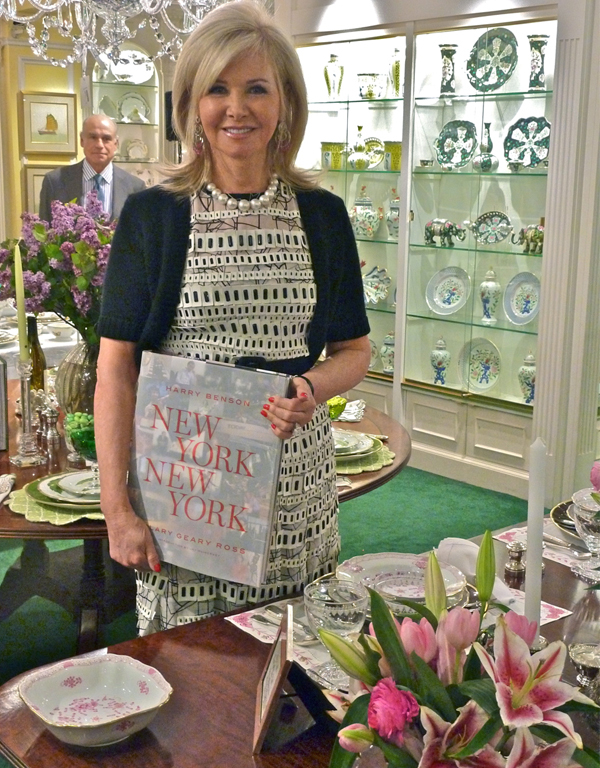 and toasting to a New York City organization that helps keep our city vibrant and beautiful. This entry posted in books, design, entertainment, gifts, interior design. Entry Tags: James Andrew, Mathew Patrick Smyth, Melissa Morris, NYC, Scully & Scully, Tabletop, The Fund for Park Avenue, Will Ryman Bookmark the permalink. When I first came to NY, I still remember crossing Park Avenue and admiring the Louise Nevelson sculpture and thinking to myself each city needs such a splendid Avenue. Each spring the tulips really are stunning! 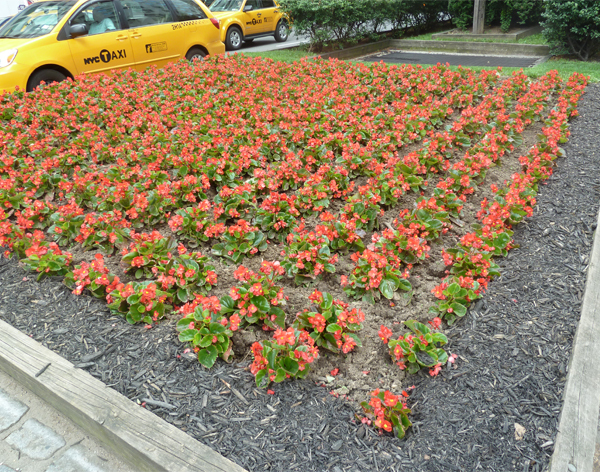 They do an amazing job making the malls on Park Avenue beautiful all year long! Fun to see all the beautiful settings at cully & Scully! 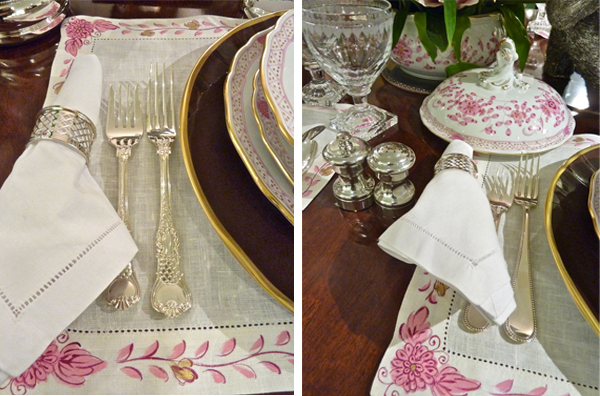 What dreamy tablescapes…..just breathtaking. 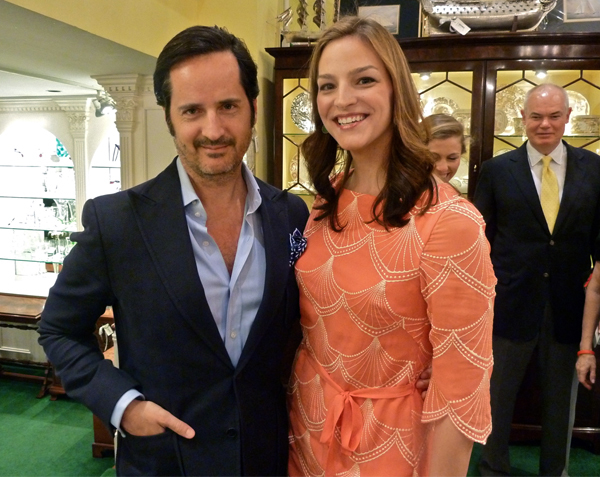 The Fund for Park Ave. does an outstanding job…. My husbands office is on Park Avenue and I know they donate to this fund and so worth it. Park is one of the must see streets in NYC. Those tabelscapes are gorgeous! You make me miss living in NYC! 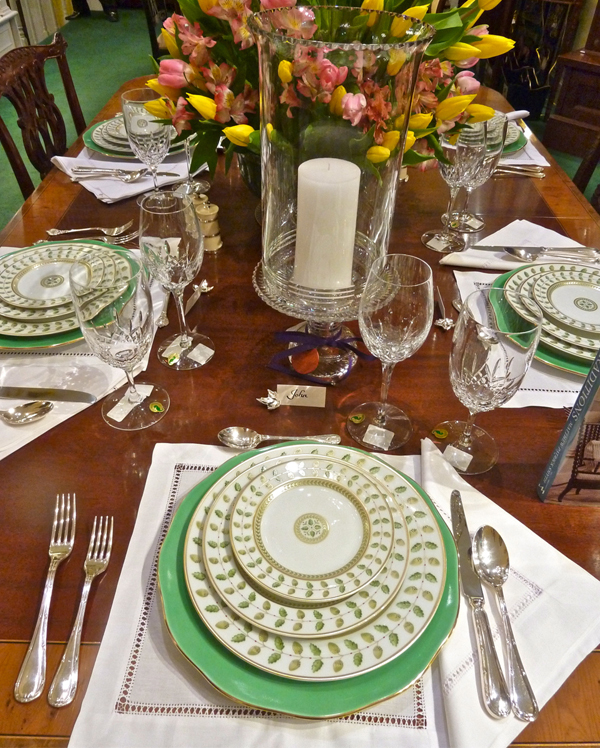 Beautiful tablescapes, Stacey!! Love them all, and I am with you on William Yeoward. 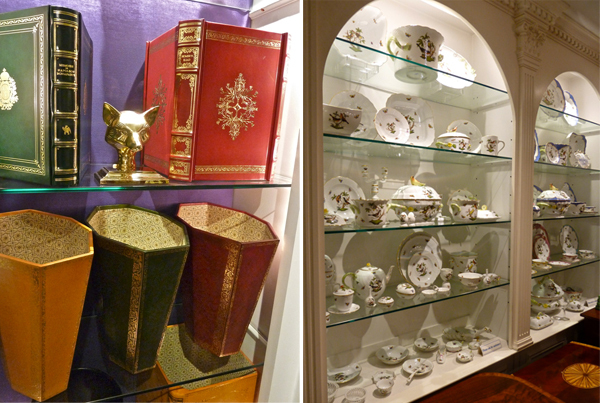 Just give me Herend, Waterford, and Yeoward and I am happy!! Lots of eye candy here! Gorgeous tables and I adore William Yeoward crystal ( I have the popular cake dome and it’s happily filled with baked goodies in my kitchen) The landscaping is so pretty in those first images. I will flag this post and come back later. How do you manage to create blogs with so much inspirational content? I admire you! p.s. Can’t wait to read TradHome today! BIG congrats!! I’ve only been to NYC a few times and I have admired the plantings and art. Both there, and in Chicago, I wonder about who pays for it all and maintains it. Thank goodness for organizations like The Fund for Park Avenue and all the people who support them. We all benefit. what a thoughtful, thorough post! you got absolutely all the highlights of the party (…i especially love my husband’s cameo). thank you for including me in this all-star round up. 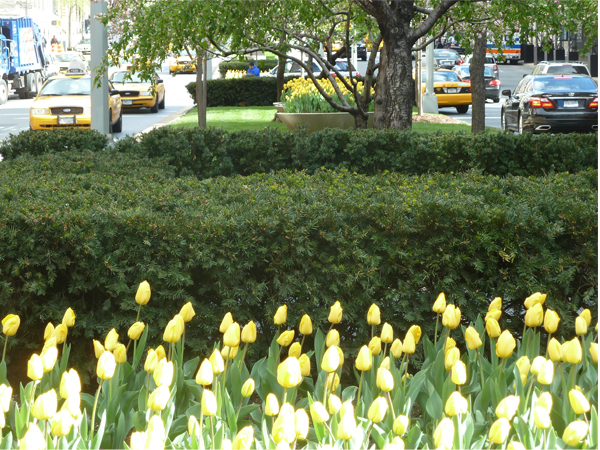 and i’d do anything to support those lovely blooming tulips on the park ave malls – they make me smile every single time i pass by them. Everything was totally beautiful and fabulous! Two things left out entirely! That divine and unusual and adorable dress of Jamee Gregory!! and James Andrew……(what is James wearing)!!! they are so chic; and need to be mentioned! And sourced!!! 80 queries in 0.800 seconds.